My Toast Hero is Jon Tickle (he of Big Brother 4 fame). He has a theory that the consistency of toast changes as it cools, therefore the second slice (as one is never enough, is it?) never tastes the same as the first slice - and he is right. He has spoken about trying to get a toaster made with a timer delay on for the second piece but my suggestion would be to create one perfect slice and then, as you are eating that slice, stick another piece of bread in the toaster for when you have finished. 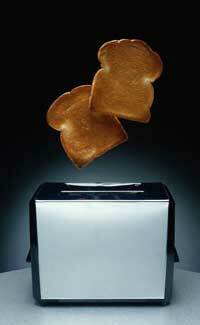 Another thing - why on earth can the makers of toasters not converse with the bakers of bread? My 4-slice toaster is great. Through trial and error I have found the setting to make perfect toast and it's all systems go. Until, that is, I try to make four slices of toast using Warburtons bread. My 4-slice toaster will not fit four slices of Warburtons bread horizontally and toasting them vertically leaves about an inch of uncooked bread. Yes, I could revert back to my original method, mentioned in the previous paragraph but what if I'm making spaghetti/eggs/cheese on toast for two people? Finally, why is French Toast eggy bread the best thing since.... erm... sliced bread? Sod the diet - I know what I'm having for supper tonight! !